The grower who has enough space and who wants to grow a high-quality type of sativa, will find a plant to his taste with the Desfrán by Dutch Passion. In terms of dimensions this is undoubtedly one of the most imposing species, so enough space for this award winner is necessary. The grower who has enough space and who wants to grow a high-quality type of sativa, will find a plant to his taste with the Desfrán by Dutch Passion. In terms of dimensions this is undoubtedly one of the most imposing species, so enough space for this award winner is necessary. 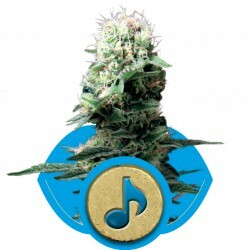 The Desfrán will then repay you with exceptionally compact buds in return, that guarantee a true destroyer-experience. Depending on your preference, you harvest this South American bestseller earlier (9 weeks after the weed seeds have been planted) or later (after 10 weeks). The sweeter your taste preference, the later you should harvest your buds. Moreover, the plant as ‘destroyer’ is more intense when harvested late. 100 percent sativa with a particularly interesting prehistory: this is the way you can describe the Desfrán by Dutch Passion. Everything South America has to offer is reflected in these cannabis seeds. A crossing of Mexican Oaxaca with Meao Thai and Colombian Punto Rojo was the starting point, destroyer with destroyer was the next step and the result is an award-winning type especially for fans of a psychedelic high. Several taste sensations (pear, grapefruit, melon and caramel) are interweaving and also the taste aroma is interesting because green apple and pear form a fresh combination. In short, buying weed seeds of the Desfrán leads to enjoying a varied rainbow of tastes. Cultivation results in a resinous variant that flowers after approximately 10 weeks. Master growers from South America are thrilled about the Desfrán, so it is definitely worth trying.